With only two episodes left this season, “Kill ‘Em All” is comfortable with filling in backstory, hunting down anonymous vampires, and finally giving us the sort of OMG twist that we used to expect on a regular basis. What does this mean for Damon? (And: how awkward is it that Bonnie's life is so tied to Damon's feelings lately?) Damon is responsible for forcing Bonnie to open the Amory vault, which might erase “all the good [he’s] been doing lately,” as Stefan put it. As Enzo pointed out, Bonnie will never forgive Damon for that--how would she forgive him for setting up the ritual that lead to her becoming Raynized? Or will she? The writers must realize the Everybody Hates Damon storyline is getting a bit old. Big twist aside, the interactions between Caroline and Alaric were my favorite parts of this episode, even though they were sort of shuttled into the corner. 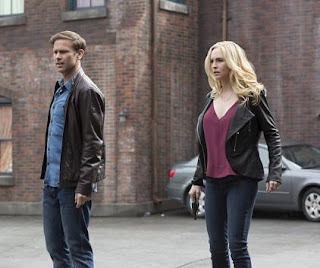 Maybe it’s just my age, or my nature, or the fact that I really like both Caroline and Alaric, but the whole “should they settle for one another” struggle is one of the first times I’ve really felt like a romantic plot on this show dovetailed with my own circumstances. Awkward? Sure. Sad? Yes. These two plucky not-so-youngsters have had some truly tragic romances, and now they’ve got a tragic unromance. But all that awkward sadness feels like the most grounded element of the show right now. Speaking of tragic romances: we got a bit more development of Matt’s backstory: he accidentally killed his girlfriend, and Stefan compelled that knowledge out of him. This makes Matt blackmailing Stefan out of Mystic Falls even more absurd than it was before. • Rayna said she wanted to see her father again. Will she? With the Other Side destroyed years ago, did we ever get a specific answer to what happens to supernaturals after death? • The two minutes of Caroline and Alaric as badass vampire hunters was like a backdoor pilot for the awesomest show in the world. • Alaric said he spent three years searching for Charlemagne’s doohickey. Why? Did Alaric want to conquer most of western Europe, too? Not a surprise, but I am so with you, Josie. As twisty as the Bonnie/Rayna stuff was, and I knew something had to be coming, and as pointlessly poignant as the Matt story was, I was fascinated by the Caroline/Alaric non-relationship. They've always been two of my favorite characters on this show, and it's obvious that for Caroline, it's all about the twins. They're not even comfortable enough to touch each other casually! And they're getting married? They're *so* not getting married. And I was so blah about Enzo for so long, but I like him with Bonnie. I'm actually sad for their current circumstances. If all Bonnie ever needed to do was to open that vault and trap the Armoury in with it, it makes the last three years, her taking the killer pills, and even Damon trading her survival for Rayna's curse absurd. I think it took three years for Enzo along with Bonnie's undercover trip to the psych ward before they even knew what the Armory was after. Or they could have just asked Alex from the start.